The emotional ties that unite aviation with the French Postal Service find their origins in the convergence of common interest that has never slackened since the time when, under the influence of Didier Daurat, Guillaumet, Mermoz, Antoine de Saint-Exupéry and all their mates, the heroes of the air wrote in golden letters the epic of the Aéropostale. The actions of these men, passionate for flight, who under all circumstances evidenced their professional ability, self-denial and courage without equal in the service of the mail, justify the very extensive homage that the administration of the P.T.T. and foreign postal systems pay them when they perpetuate their memory through the publication of stamps engraved with their effigies or commemorating some great aeronautic adventure. 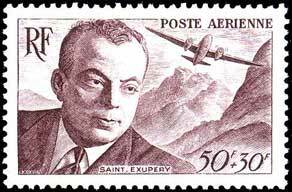 Among all these pilots, Antoine de Saint-Exupéry has six times entered into the prestigious kingdom of philately: first in 1947, in French West Africa, then in France in 1948 and 1970, Cameroon in 1977, and finally in 1978 in the archipelago of Grenadines and in Chad. It was in 1947 that French West Africa, nearly twenty years after the appearance of Southern Mail, returned homage to Antoine de Saint-Exupéry, whose flights as much as his writings led us to discover the fascinating and wild beauty of this faraway land of France. The dotted line that shows the departure from France, then the entry into Morocco, the Rio de Oro, Mauritania and Senegal, displays the itinerary Toulouse - Casablanca - Agadir - Cape Juby - Villa Cisnéros - Port Etienne - Saint-Louis of Senegal - Dakar, evoking the entire history of the Aéropostale, with its tragedies, pains and joys, its memories "that left a lasting taste," and the assessment that Saint-Exupéry made when he recalled all the hours it had taken, and of which he wrote that he "remembers those which no luck had gotten him." 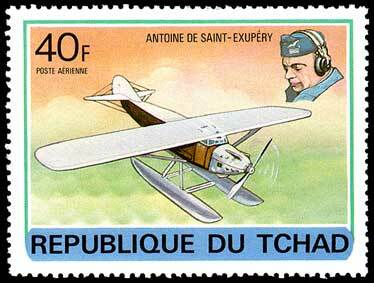 Pierre Gandon designed and engraved in 1947 the first French stamp dedicated to Antoine de Saint-Exupéry. Now 80, born January 20, 1899 in Hayles-Roses, Pierre Gandon is without a doubt one of best known among our creators of postage stamps, as much in France as in the rest of the world, where he has established an eminent position. Philatelists owe him more than a thousand examples, and some among them, like a certain Belgian collector, choose to collect only those stamps signed "Gandon." Several times winner of the Philatelic Art prize and the Europa prize, including that for "the most beautiful stamp in the world," Pierre Gandon reserves, however, at the bottom of his heart, a privileged place for this stamp that he dedicated to Antoine de Saint-Exupéry. In fact, enlisted in 1918, he was himself aviator observer in the squadron commanded by General Weiss, and some years later became friends with Saint-Exupéry, whom he had met at "Les Deux Magots," along with, every Monday, Picasso and Léon-Paul Fargue. Testimony of the friendship returned by the aviator and artist to his departed friend, faithful evocation of a precise memory, it is perhaps more a Saint-Exupéry of the literary café, as he had rubbed shoulders with him at "Les Deux Magots," than the pilot, to whom Pierre Gandon had wanted to pay homage through the design of this stamp. The surtax of 0 F 30 that was added to the postage value of 0 F 50 was for the French Mutual Aid Society (l'Entraide Française). Jean-Paul Pheulpin, born October 2, 1907 at Valentigney (Doubs), entered the School of Fine arts in 1932, and followed a career as an art teacher until finally, from 1950, devoting himself to the design and the engraving of postage stamps. He has designed more than four hundred, and was awarded the Grand Prize of French philatelic art and the Grand Prize of international philately in 1958, that of the Thirteen African Nations and Madagascar in 1972, and the Prize of the Overseas Territories in 1973. It is to Jean Pheulpin that we owe the creation in 1970 of this stamp where Jean Mermoz and Antoine de Saint-Exupéry, each enclosed in the oval of a medallion, as in a cockpit, seem to pursue an eternal dialogue while, shooting from the sea, the unusual presence of a Concorde, here, in accordance with the wishes of Robert Galley, then Minister of the P.T.T., evoking the crossing of the Atlantic, and recalling the pioneering flights of Mermoz and Saint-Exupéry some forty years earlier. Since March 17, 1951, the administration of the P.T.T. has put into service a special "First Day" commemorative postmark, including the topic, the date and the place of the sale of the stamp. It was on September 19, 1970 that the city of Lyons, where Antoine de Saint-Exupéry was born, shared with Aubenton, county seat of the canton of Aisne, homeland of Mermoz, the privilege of the pre-sale of this stamp and the "First Day" envelope. Further, at this same opportunity, the C.E.F. 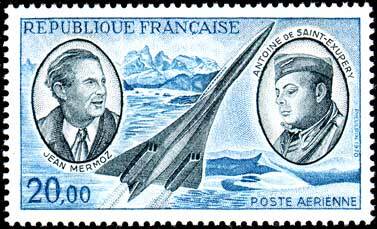 gave out a philatelic leaflet and a post card on which Mermoz and Saint-Exupéry share the illustration. Not yet withdrawn from sale. It is not necessary to introduce Paul Lengellé to readers of Icare. Acclaimed painter and designer, he is well-known in the aeronautic world for his canvases and watercolors, of which the most beautiful illustrate numerous works dedicated to aviation and, in particular, to General Chambe. The Museum of the Air, the Museum of the Army and the one of Air-France share, among them, close to a hundred works signed Paul Lengellé. Philatelists, for their part, know him through the postage stamps which he has designed and of which one can mention, without leaving the domain of wings, the air-bus 300 BS, the Noratlas, the Mystère IV, and the Fouga Magister. But rivaling in talent her husband, with whom she shares the passion for aviation as well as that for painting and design, Nelly Lengellé sometimes captures first place. Thus it is that we owe to her charming hand the design of the Saint-Exupéry stamp, which she wanted, in its imagery, to depict the Little Prince. In 1977, the Postal Administration of Cameroon produced an "Air Post" set of six stamps with the theme of an aviation retrospective. The first three of these, with face values of 50 F, 60 F and 80 F, are dedicated to the "Pioneers of the Aero-Postal", especially commemorating the aviators themselves. The final three, with values of 100 F, 300 F and 500 F, celebrate events. 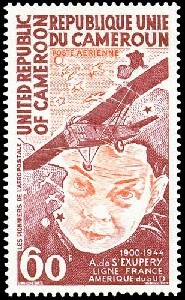 The stamp dedicated to Antoine de Saint-Exupéry, figures, naturally, among those that pay homage to the pioneers of the Aéropostale, alongside Jean Mermoz (1901-1936), whose blue and orange stamp commemorates the first aerial link between France and South America in 1930, and Maryse Bastiés (1898-1952), whose blue and carmine stamp evokes her 1936 Dakar-Natal flight in the Simoun F-ANXO. The set is completed by three different images, dedicated respectively, to the first Marignane-Douala airmail flight by Sikorsky in 1937, the 50th anniversary of Lindbergh's solo crossing of the Atlantic, and the first supersonic transatlantic crossing by Concorde. Formed by a multitude of small islands, the archipelago of the Grenadines, situated in the Lesser Antilles (Federation of the West Indies, Windward Islands) constitutes a dependency of Grenade, in English: Grenada. Grenada, the other island of the "Lesser Antilles", is situated at the southern tip of the arc formed by the Windward Islands. It capital is Saint George, and it has 91,700 inhabitants. Discovered by Christopher Columbus in 1498, it was then acquired successively by the government of Martinique in 1650, passed on to the French Company of the West Indies in 1665 as a dependency, then to the Crown in 1674. Taken by England in 1762, retaken by the Count d'Estaing in 1779, it was returned to England in 1783 under the treaty of Versailles. It is from this faraway land, a part of France for a brief time, that one of the last stamps dedicated to Antoine de Saint-Exupéry comes to us. 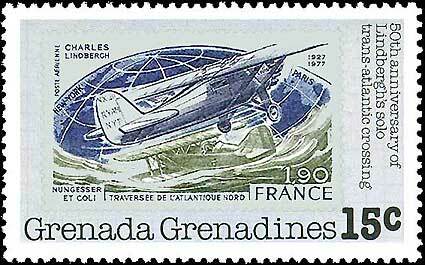 In 1978, the philatelic service of the archipelago of the Grenadines, on the occasion of the 50th anniversary of the solo crossing of the Atlantic by Charles Lindbergh, released a stamp which presents, in reduced form, the image of one issued by France in 1970 in honor of Mermoz and Saint-ExupÉry, to which has been added, besides the local postage value of 15 cents, mention of the "50th anniversary of Lindbergh's of solo trans-atlantic crossing" and of course, the country of origin, "Grenada Grenadines". It is to say the very least curious that this faraway English possession should choose Mermoz and Saint-Exupéry to commemorate the famous flight of the American pilot, while exploiting the artistic work of Jean Pheulpin. For it is apparent that neither Jean Pheulpin nor the official services of the postal museum, Maison de la Poste et de la philatélie, had been warned of this "pirate emission". But how can we not be delighted with this duplicate homage paid to the two French pilots on the one hand, and to the creator of the original work, Jean Pheulpin on the other? Everyone knows that the name of "Saint-Exupéry" has been given to numerous school establishments, homes, youth houses and army messes. Some among them have marked their birthday celebration with a unique flair. Thus the "Saint-Exupéry Home", for the youth and the culture of Reims, in collaboration with the administration of the P.T.T., created a commemorative postmark, used exclusively on February 5 and 6, 1966 on the occasion of the 20th anniversary of its foundation. Doesn't this compilation, not at all exhaustive, of some of the philatelic tribute paid to Antoine de Saint-Exupéry, reveal the influence that he exercised on his contemporaries, still filled, today, with the "myth of Saint-Exupéry"! It is probably not useless to define, for readers unaware, some of the esoteric terms dear to philatelists. Perf: This concerns the characteristics which define the perforations, situated in the margins of the stamp for the purpose of facilitating its separation from the sheet. This expression is always followed by a number that precisely indicates the number of teeth contained in a 2-cm length. This measurement is determined with the help of special ruler called a perforation gauge. Example: Perf 13 means that the stamp so defined has 13 teeth per 2-cm length on all four sides. Perf 13 x 14 means that the horizontal side includes 13 teeth per 2-cm length, and the vertical side 14. Size: The size of a stamp is expressed in millimeters and only concerns the drawing, without margins. The horizontal dimension is always indicated first. 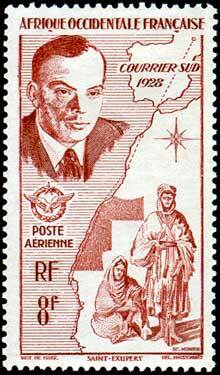 The last known stamp dedicated to Antoine de Saint-Exupéry comes to us from the Republic of Chad, with such discretion that it has not yet been possible to discover the designer. On March 15, 1978, Grenada Grenadines issued a set of six stamps (and a souvenir sheet with two more) commemorating the 75th anniversary of the first zeppelin flight, and the 50th Anniversary of Lindbergh's solo crossing of the Atlantic. Each of the stamps displays a stamp issued by another country depicting either Lindbergh or zeppelins... except for the 15¢ value (above), which shows a French airmail stamp of 1970 (Scott #C43, above) commemorating the French pilots Saint-Exupéry and Mermoz, and the Concorde airplane. 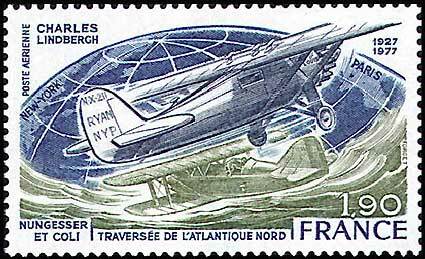 What makes this all the more intriguing is that in June of 1977, nine months before the Grenadines set came out, France had issued an airmail stamp (Scott #C49, below), which did commemorate Lindbergh's flight! So, what happened to this 15¢ value? He just had to copy those countries and Scott catalog numbers into the procurement form  actually almost a month overdue already  and his work would be done for the day. He reached for his glasses, but, whether because of the stop he'd made earlier to the Christmas party in Accounting, or maybe because he'd been out late the night before, his hand slipped, and they went crashing off his desk onto the floor. "Damn! A pretty new pair, and now I've cracked both lenses." Well, there was nothing he could do about that today. 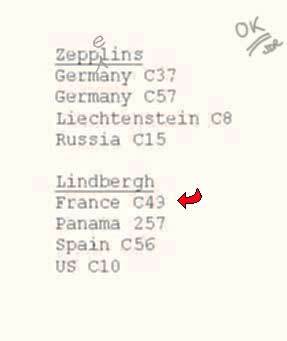 He wrote out the list with squinted eyes, never noticing that he'd miscopied the "France C49" as "France C43." 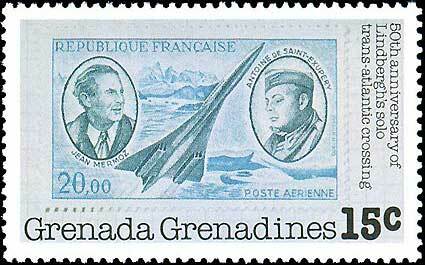 An old typewriter with a broken 9, some shattered glasses and a little too much Christmas cheer... and Saint-Exupéry and Mermoz replace Lindbergh on the 1978 Grenada Grenadines Lindbergh commemorative issue!